At dinner Sunday night, I asked my friend Prasad if he knew about the new farm bill and what it means for average Americans. He didn’t. I wasn’t surprised. With the election, the war, and rising prices to fret about, not many people are pondering legislation about farms. But they should, because it has huge implications for the country’s nutrition, environment, and health. Here are three reasons why we all should pay closer attention to the 2007 farm bill: food, fuel, and fat. The farm bill, which is renewed every five or six years, is a vast set of laws and policies that governs how our food is produced and priced. Recently, it has included conservation programs aimed at setting aside land to aid ecosystem recovery and improve water quality, but historically it has provided huge payments to just a handful of crops including wheat, soybeans, cotton, and corn. The first farm bill, passed during the Depression, established price supports to protect farmers and rural communities. The Agricultural Act of 1938 mandated price supports for corn, cotton, and wheat; the Agricultural Act of 1949 established supports for other commodities including wool, mohair, honey, and milk. These two laws form the backbone of today’s farm bill, and this is part of the problem. A system established in an agricultural landscape vastly different from today’s is still in place, and the effects are profound. Let’s look at how one particular crop has helped change American life and how retooling government supports for it could be a boon for all Americans. Corn is so prevalent in American food that you’re likely to be eating it even if you don’t know it. Chug a Coke, chomp on a chicken nugget, bite into a burger, and most likely you’re ingesting processed corn. Why is corn everywhere? Part of the reason is a subsidy system that has helped glut the marketplace with corn and left the government to find ways to use it. Nowadays, ranchers feed corn to their cows and chickens, and food companies sweeten their foodstuffs with it. This not only affects the price of strawberries and broccoli at your local farmers market; thanks to recent government mandates for ethanol, corn affects what you pay at the pump. Some nutritionists and researchers are even starting to trace a link between the high prevalence of corn in our diet and our weight problems — and, by extension, a host of health issues stemming from being overweight. According to the National Institutes of Health, 64.5 percent of U.S. adults are overweight or obese. That’s up from just 25-45 percent of Americans in 1992, according to the International Journal of Obesity. A number of conditions of our modern lifestyle contribute to our weight problem: sedentary jobs make us less physically active, we eat out more than in, and portion size has ballooned. But corn may also play a role. In a recent article in Environmental Health Perspectives, Barry Popkin, a professor of nutrition at the Carolina Population Center of the University of North Carolina, argued that an artificial price gap created by subsidies makes nutritionally valuable foods more expensive than nutritionally poor food and thus more attractive to penny-pinched consumers. Writer Michael Pollan is blunt about the problem: “We’re subsidizing obesity,” he told the Christian Science Monitor. One might conclude that corn growers and other beneficiaries of government subsidies have been playing on an uneven playing field for more than five decades. What happened to free markets? Government farm programs, once designed to limit production and support prices (and therefore farmers), were quietly rejiggered to increase production and drive down prices. Put another way, instead of supporting farmers, during the Nixon administration the government began supporting corn at the expense of farmers. Corn, already the recipient of a biological subsidy in the form of synthetic nitrogen, would now receive an economic subsidy too, ensuring its final triumph over the land and the food system. The farm bill, like other New Deal public-support systems, grew out of needs tied to difficult conditions, but as farming and economic circumstances have changed, the law has not kept pace with evolving needs of lands and the people who work them. Meanwhile, lobbying around the crops getting the subsidies has strengthened. Those on the receiving ends of the monies don’t want to give them up. The system stays largely stuck in the past. Some major changes did occur in the 1980s, though. As scientists and politicians saw increasing environmental degradation of agricultural lands, conservation programs were designed to protect natural resources and to reward farmers. The 2002 farm bill ramped up conservation payments. But corn threatens to throw a wrench into this progress. With farmers growing more and more corn, land formerly cultivated in soybeans or set aside as conservation reserves is now being cultivated for corn. The rush to corn is exacting a serious environmental toll. One of the country’s most resource-intensive crops, corn requires huge amounts of fertilizers and water. As Pollan put it, “Hybrid corn is the greediest of plants, consuming more fertilizer than any other crop.” Nitrogen from fertilizers applied to cornfields eventually finds its way to our waterways, degrading water quality and choking out fish. 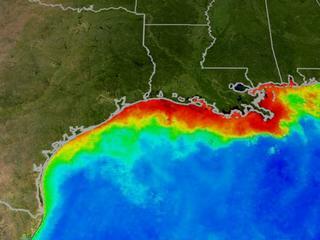 Eventually that nitrogen finds its way to the ocean where it can cause huge dead zones — large patches of the ocean depleted of oxygen and virtually all life. The need for irrigation is also of concern. While most crops need irrigation, corn is particularly thirsty. Consider the Ogallala Aquifer, the huge underground reservoir underlying eight states from Texas to South Dakota. According to the USGS, the Ogallala supplies about 30 percent of all our water used for irrigation. Corn-based biofuels draw even more — anywhere from three to six gallons of water per gallon of ethanol, according to Environmental Defense Fund. The aquifer was formed millions of years ago, and the water there today has been around for thousands of years. However, we are pumping water out of so fast that we are in danger of pumping it dry. By some estimates, the Ogallala could be used up in as little as 25 years. From a water point of view alone, our rush to corn does not seem sustainable. Now, eating and growing corn are not bad in and of themselves, but producing too much corn has wide-ranging negative effects. So we should take note of how our tax dollars are helping flood and pervert the marketplace with easy corn, because we’re paying a really high price in terms of nutrition and environmental problems. This is where the farm bill comes in. As farmers naturally look to boost profits, Congress should take the long view of our country’s health. Rather than supporting subsidies that create a kind of gold rush for corn, perhaps the government should consider diversifying its support for a whole range of crops that not only need help but would also provide across-the-board benefits for Americans. Boosting conservation programs and evening the playing field among growers of different crops — like broccoli, carrots, apples, almonds, and spinach — could lead to trimmer, healthier bodies and an environment that provides good water quality and promotes affordable food. Next time you sit down to dinner with friends, ask them what they think they’re eating. Whatever it is, the chances are, it contains corn. Maybe we should think about changing that.